AVG Anti-Virus 8.5 Free Edition 8.5 is the latest free antivirus solution from AVG that provides basic anti-virus and anti-spyware security protection for Windows user PC. 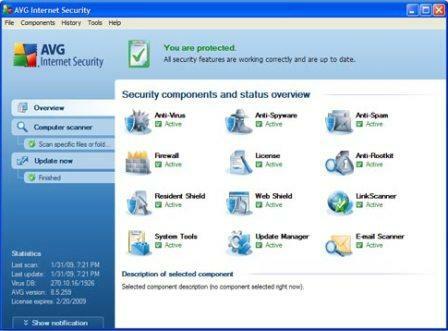 The new AVG Anti-Virus 8.5 Free Edition has added LinkScanner Active Surf-Shield that checks web pages for threats and exploits in real-time, just before user clicks on the link, and integrates online services such as Virus Top Threats, Virus Encyclopaedia, virus removal section, AVG Free forum, documentation and frequently asked questions. AVG Anti-Virus Free Edition is only available for single computer use for home and non commercial use. AVG Anti-Virus Free Edition can always be downloaded from http://free.avg.com/download?prd=afe, or download AVG Anti-Virus 8.5 Free Edition version 8.5.386 using the following direct download link: avg_free_stf_en_85_386a1586.exe.